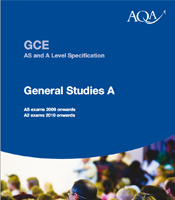 We are not developing a new A-level General Studies qualification due to government changes to A-levels. As an alternative, you may like to consider our Extended Project Qualification, which we have recently updated to meet the changing needs of students, teachers and universities. Find out more about these changes and which qualifications we are planning to offer in the future. You can also contact the customer support team using the details below. contribute towards the AQA Bacc as a Breadth of Study element. work independently and with others.